Name – it may be Project Managers for example. A handy tip is to create it with the same name as the library / list you are planning to link it to. About Me – it is very important to copy the URL of the site this group is applicable to and paste in here! If you do not, it will be near impossible to access it again without a third party tool to manage permissions. See more on this below. Group Owner – you can only have one person as the owner. Don’t forget to change this name if that person leaves the organisation. Who Can View Membership of This Group – it is very important to change the default setting and make it “Everyone”! Troubleshooting permissions makes up 80% of all support calls – this setting makes it even harder. If you leave it as Group Members, when you click on that group when you are not a member, you will see “You do not have permissions to view this group”. This makes is real hard to get help from the Site Owners when you don’t know who they are. It doesn’t matter who can see the members of the group, you need to know who the next person is in line to get assistance from. Who Can Edit the Membership of the Group – this does matter however, especially if this is an Owners group. You don’t want all the people in that group having the ability to add and remove people, there will be no control. Make sure only the owner of the group can edit this. 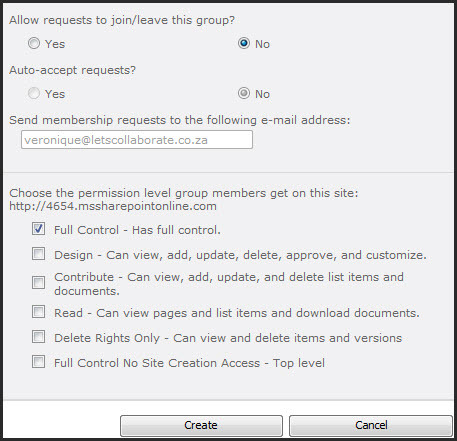 Allow Requests to Join / Leave the Group – you can decide if you want people to be able to request access to a group. Auto-Accept Requests – unless this is a Visitors group, it is absolutely not advisable to to auto-accept anything. You can only enter one email address in that field. Choose the Permission Level Group Members get on this Site – if you are creating a new Members, Owners, Visitors group for a team site, you would tick a box now to assign permissions. If you are planning to allocate this group to a list or library, you wouldn’t tick it now, you would do that in the settings of the applicable list or library. (Otherwise all these people would just have general access to the whole site, not just the list or library). A site collection admin can change this yes. Yes you can. You need to be a Site Collection Administrator to do this though. SCA’s have full rights on the site collection and can go change the owner in the site permissions. the group owner of our sharepoint site leaves the company without changing it to the new owner. is there a way to this from the backend? This doesn’t mean that if you feel the urge to smoke and you do tat you have a weak will. significant alyernative is hypnosis or hypnotherapy. Not many know that by just takin care of your caffeine intake you can reuce your cholesterol level to a greater extent. as the quit smoking aid you are going to use. waiting ffor your next write ups thanks once again. I mentioned that setting Laurent, which one are you referring to? I actually forgot about the View Permissions link, that is true, but it’s still a bunch of extra clicks to get there. It’s not that hard to get users to put the links in actually, my clients find it easy to manage when they have been inserted. But I do really like your idea of adding an extra description about the group. That is a good idea! I’ll be incorporating that into my permissions training on that subject. Great advice, but I think that your recommendation of adding the URL of the applicable site is very difficult for Site Owners to maintain. If you are creating a special group for Project Managers, as in your example, it’s probably to give them “extra” permissions in select areas of one or more sites (i.e., a few lists or libraries), not a whole site. I definitely think that the About Me section should be filled in when you create a special security group – with a description of the basic intentions for the group (for example: Use this group to identify Project Managers who will be able to assign tasks and view “PM-only” libraries). However, I think it’s really hard to expect site owners to remember to add the URL of each and every list that the group has been assigned to – especially if the group is used on multiple sites. 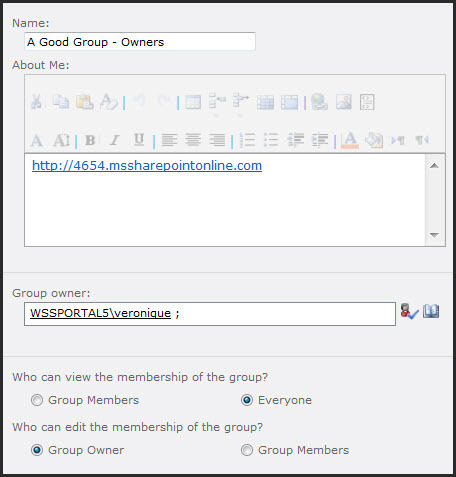 Fortunately, in SharePoint 2010, even without a third party tool, you actually CAN look at the group in one place and see what it has access to. 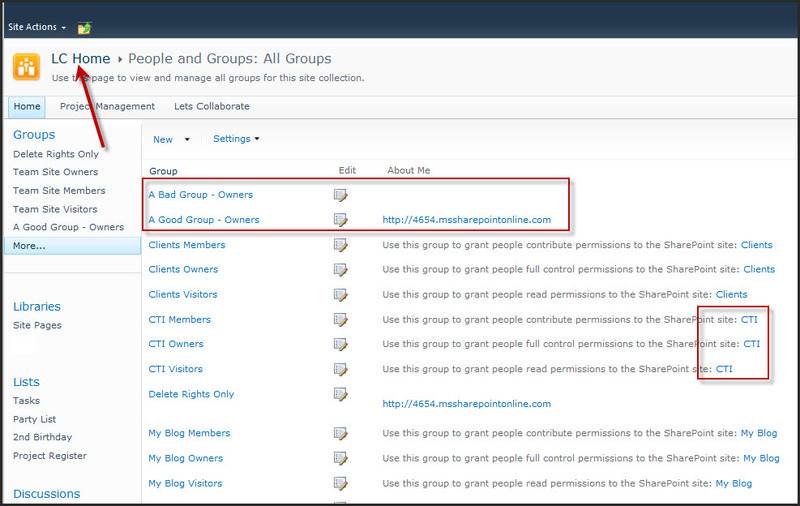 If you are in the Group, select Settings > View Group Permissions and you will be able to see where this group has access all across the entire site collection. It’s a pretty handy feature and is probably a bit more realistic than relying on site owners to remember to keep that “About Me” area up to date with each list and library. I’m a big, big fan of third party tools to help with permission management, but this is one area that SharePoint 2010 can handle on its own. Only a pleasure Derec, glad it’s helping.